The show celebrates the 40th anniversary of Ntozake Shange's award-winning for colored girls who have considered suicide / when the rainbow is enuf, the landmark poem and play featuring women of color, represented by various hues, reciting monologues that touch on race, gender, sexuality, and love. i found god in myself was created by Harlem journalist and curator Souleo, who first put on the show in 2014 with only 20 works. 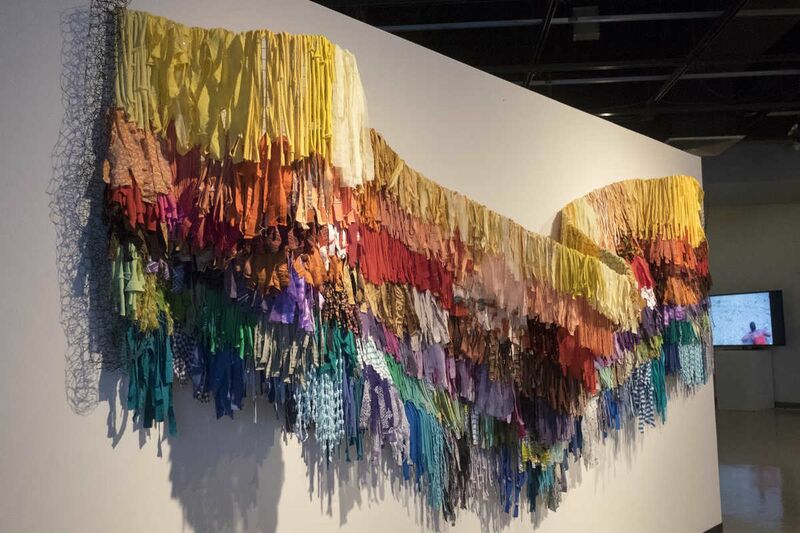 In collaboration with the African American Museum, the show expanded to more than 40 pieces in which the artists take on their own interpretations or translations of Shange's pieces. In addition to the exhibit, the African American Museum will host a screening Friday of For Colored Girls, a 1982 PBS video version of for colored girls, featuring Alfre Woodard and Lynn Whitfield. We sat down with Souleo and asked him about the must-see pieces in the exhibit. It's a strong, powerful image of a black woman that made me think of a fighter and an activist. It also highlights the major issue in the black community when it comes to how we define "good hair." I selected it because I wanted to reference these global issues that face women, when we talk about economic disparity and unequal pay. Gregory was born in New York but raised in Haiti. He understands firsthand the effects of poverty on the psyche. Her face is stoic, somber, but there's a strength and vulnerability within that as well. He surrounds her with pastels and light colors that juxtaposes with her and the overall heavy subject matter. There's a sense of hope. When you look at postindustrial or postriot places, women from these communities get seen as poor and rundown. You see this woman going through this place that's dilapidated, but she finds the beauty within her community and herself. This poem is powerful. It's about Beau Willie Brown coming from the war. He has PTSD and he's violent. He's abusive to his woman. Through these bottles, [Britto] narrates their story. From when they fall in love, to the abuse, and when he throws the kids out the window. ... He did a really powerful job of staying true to the text and highlighting the issues of mental health, violence, and alcoholism. Lady in Red is ending a love affair where she felt devalued. I love that Kathleen touched on this universal notion of heartbreak. The piece with the heart open and crochet strings dangling shows that she's been broken apart, but she's putting herself back together. A lot of times, the older you get, the more invisible you get to society. What Dindga did was highlight the strength and wisdom from a woman who has been through things but can share her wisdom with others. This is a powerful image of rebirth and renewal, hope and passion. Dr. Shange's text always references music, and this was a great way to highlight that. It represents Lady in Red after she's been with her lover. She asks her lover to leave and has a spiritual bath. Beau brings it to life with decorative buttons. It's a sanctuary of inner peace and self-love. From a technical standpoint, to sew buttons through a caste-iron bathtub is mind-boggling. If there's any piece that represents the entire concept [of the exhibit], it is this. All of the different ladies are represented by the different colors in the rainbow. When people look at it, they immediately want to jump in front of it and embrace it and hopefully embrace themselves. It's a rainbow of hope. I also think of the LGBT community, which played a large part in ushering in for colored girls. She has three video pieces. In one of them, she's reciting the poem while showing images of the stuff in her studio/apartment that she uses to express herself. The second video has her interviewing women talking about what has been taken from them financially or healthwise. The last one shows images of [Diane] after domestic violence. She shows her bruised eye and stats on domestic violence. [The piece is] surrounded by butcher paper and cardboard, thrown-away things that get taken for granted. It makes me think of the black woman's body and how it's viewed in society. She's taking these things and finding beauty and strength in them. [It's the] journey of unpacking and understanding of our lives and not taking ourselves for granted or letting anyone else do it. Through Sunday, African American Museum of Philadelphia, 701 Arch St. Free with admission, 215-574-0380 ext. 225, www.aampmuseum.org.